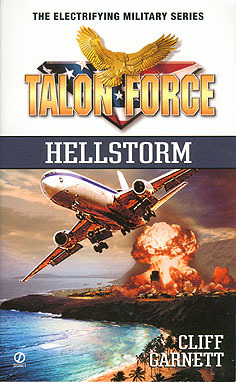 TALON Force is a series about the highest level special ops team in the US military. The characters are well-conceived and make an interesting team, with lots of the interaction I like. Of course, there are nine books in the series, each written by a different person under the Cliff Garnet house name, so I worked the elements that I liked within a house context. I was looking to get over to Hawaii when I took this assignment so the climax is set on the Na Pali coast and Waialeale Peak of Kauai, after time spent (by the team) in Tokyo and the wilds of China. The plot, from 1999, involves flying commercial airliners packed with a deadly nerve agent into six West Coast cities. The publisher is Signet, which is always a classy operation, but the covers on this series were exceptionally well done.